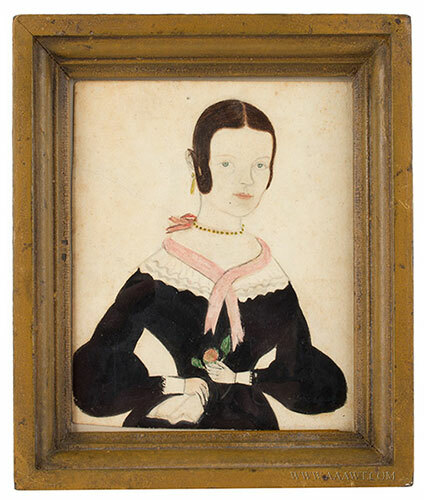 Presented here, a Watercolor and Pencil Portrait of a lovely, feminine young woman with yellow earrings and holding a pink Rose, by Jane Anthony Davis (1821-1855). J.A. Davis was a very prolific portrait painter, born in Warwick, Rhode Island and worked in South-Central New Hampshire, Northeastern Massachusetts, Eastern Connecticut, and Rhode Island. When she signed her work it was "J. A. Davis", using only her initials like many woman artists of the time. Because of this, for many years she was thought to be a man until further research uncovered the fact she was indeed a woman.